Genuine Cadillac / GM center hubcap. fits many Seville, Deville, CTS, STS and DTS models. Will work fine and stay in place. This cap is missing only 1 tab. THIS BROCHURE SHOWS THE MODEL LINE UP FOR 1967 CADILLAC. THIS BROCHURE IS A MUST HAVE IF YOU HAVE A 1967 CADILLAC FOR THE CAR SHOWS! DEVILLE CONVERTIBLE. THIS IS 22 PAGE BROCHURE. ACCESSORIES OPTIONS SECTION (AVAILABLE OPTIONS IN 1967). Sedan Deville----Coupe Deville----Eldorado----Seville----Fleetwood Brougham----Fleetwood Limousine. Here we have a1979 Cadillac Full Line DELUXE sales brochure. This is an original brochure NOT a reprint. Original 1974 Cadillac Advance Upholstery Information. 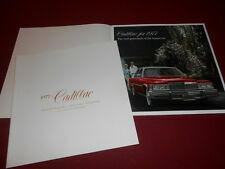 1966 CADILLAC DEVILLE 2 ORIGINAL POSTCARD / BROCHURE PAIR 66 CONV.. & HDTP. Sedan Deville. Coupe Deville. This is an ORIGINAL brochure, NOT a reprint. 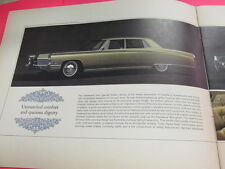 This brochure covers the following models Fleetwood Brougham. 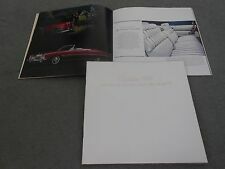 Features of this brochure 1973 Cadillac Full Line DELUXE sales brochures. Here's that old advertising brochure you've been looking for. It covers the 1965 Fleetwood and De Ville mod. Here we have a1960 CADILLAC Full Line sales brochure. This is an ORIGINAL brochure, NOT a reprint. Eldorado Brougham. Coupe Deville. Sedan Deville. Fleetwood 60 Special. This brochure covers the following models. Sedan Deville----Coupe Deville----Fleetwood----Fleetwood d'Elegance. Here we have a1985 Cadillac Deville/Fleetwood sales brochure. This is an original brochure NOT a reprint. This brochure covers the following models. Allante----Deville----Touring Editions----Fleetwood D'Elegance----Fleetwood Sixty Special----Fleetwood 75 Limousine. Brougham---- Eldorado---- Seville----Cimarron. Here we have a1987 Cadillac Full Line sales brochure. 1973 Cadillac Calais. 1973 Cadillac Eldorado. 1973 Cadillac DeVille. 1973 Cadillac Fleetwood. 1973 Cadillac Fleetwood 60 Special Brougham. 1973 Cadillac Fleetwood 60 Special. 1973 Cadillac Fleetwood 75. ORIGINAL BROCHURE. Sales Brochure. Unique historical ORIGINAL Literature item. (may have slight wear marking associated with storage). VALUE PRICED ! Calais coupe/sedan----Sedan Deville----Coupe Deville----Eldorado coupe----Eldorado Convertible----Fleetwood Sixty Special Brougham----Fleetwood 75 Limousine. Here we have a1971 Cadillac Full Line DELUXE sales brochure. And you ALSO GET the '96 CADILLAC INVITATION to TEST DRIVE the NEW MODELS, a 6-PANEL FOLDOUT, with PHOTOS and BASIC INFORMATION on EACH MODEL and a LARGE SECTION on CADILLAC TECHNOLOGY. 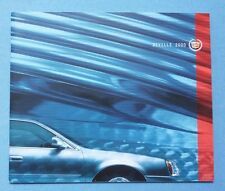 You get 2 ORIGINAL '96 DEVILLE and DEVILLE CONCOURS BROCHURES for ONE LOW PRICE! Eldorado----Eldorado Touring coupe----Seville----Seville STS. Brougham----Brougham D'Elegance. Here we have a1992 Cadillac Full Line Deluxe sales brochure. This is an original brochure NOT a reprint. 1962 Cadillac Eldorado. 1962 Cadillac DeVille. 1962 Cadillac Series 60 Fleetwood. 1962 Cadillac Series 75 Fleetwood. You will find out the dealer's "inside information" that is far more detailed than a sales brochure. 1961 Cadillac Eldorado. 1961 Cadillac DeVille. 1961 Cadillac Series 60 Fleetwood. 1961 Cadillac Series 75 Fleetwood. 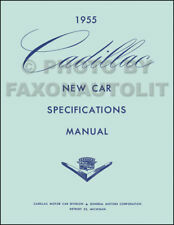 Exact Title: "1961 Cadillac Data Book". 1961 Cadillac Series 62. This is a dealer-only album that salespeople used. CADILLAC DEVILLE, SEVILLE, ELDORADO, BROUGHAM, AND LIMOUSINE. 1978 CADILLAC SPECTRUM DEALER SALESMAN BOOK SPECIFICATIONS BOOK. This is the original catalog, printed by GM, that allowed owners to deck their cars out with original Cadillac accessories. You can use this catalog to find out which features on your car are accessories, if those accessories are original, and which accessories you can add. You will find illustrations of factory options such as defogger, seat covers and belts, mats, litter box, license frame, cruise control, automatic headlights, compass, automatic leveling, and more. 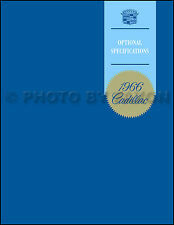 This catalog covers all 1967 Cadillac models, including Calais, Deville, Eldorado, Fleetwood, 60 Special, and 75. Buy now to find out how to make your car into a "loaded" model. 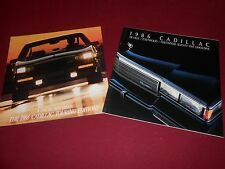 And you ALSO GET the '95 CADILLAC INVITATION to TEST DRIVE the NEW MODELS, a 6-PANEL FOLDOUT, with PHOTOS and BASIC INFORMATION on EACH MODEL and a LARGE SECTION on CADILLAC TECHNOLOGY. You get 3 ORIGINAL '95 DEVILLE and DEVILLE CONCOURS BROCHURES for ONE LOW PRICE! Calais series----Deville series----Eldorado----Fleetwood series. Here we have a1967 Cadillac Full Line sales brochure. This is an original brochure NOT a reprint. It is in VERY GOOD condition. This brochure covers the following models. 1997 CADILLAC SEVILLE DEVILLE ELDORADO. NEW DEALER BROCHURE. This is original color sales literature right off the showroom floor. You will find pictures and illustrations of the interior and exterior of the Brougham, Seventy-Five, Eldorado, Sedan deVille, Coupe deVille, Calais, Coupe, limousine, and convertible models. You will also find a list of the available options, accessories, features, and engines for 1972 with basic specifications. The brochure measures 10.25" x 9", has 24 pages, and is in MINT CONDITION. 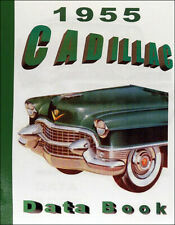 Buy now for this original sales catalog from Cadillac. This is a dealer-only album that salespeople used. This book was made to train salespeople on how to sell Cadillacs. It explains the benefits of owning a Cadillac through key features of each model for technology, exterior, interior, powertrain, and quality. The book compares the cars to other luxury brands such as Buick Electra Limited, Lincoln Continental, Town Car, Mark V, Versailles, Mercedes 450 SEL, Olds 98 Regency and Toronado. You'll see charts for each model of Cadillac and its competition detailing dozens of specifications: engine specs, mechanical features, fuel economy, interior and exterior dimensions, and more. You'll see side-by-side comparisons of one Cadillac model and one competitor showing standard and optional equipment on each, and pointing out key features. 1969 Cadillac Calais. 1969 Cadillac Eldorado. 1969 Cadillac Fleetwood 60 Special. 1969 Cadillac Fleetwood Brougham. 1969 Cadillac DeVille. 1969 Cadillac Fleetwood. 1969 Cadillac Fleetwood 75. Exact Title: "1969 Cadillac Optional Specifications". "Cadillac 1980 An American Standard for the world." This is original color sales literature right off the showroom floor. You will find pictures and illustrations of the interior and exterior of the Fleetwood Brougham, Coupe De Ville, Sedan DeVille, Eldorado, Cadillac, Seville, and limousines. You will also find a list of the available options, accessories, features, and engines for 1980 with basic specifications. The brochure measures 9.75" x 8.25", has 32 pages, and is in MINT CONDITION. 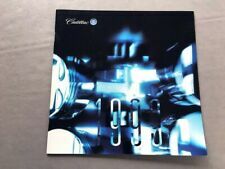 Buy now for this original sales catalog from Cadillac. Very nice used 1958 Cadillac Prestige Color Sales Brochure. This high quality Brochure has the rare white and blue outer cover. Specifications are section is on the last page. THIS BROCHURE IS COMPLETE AND IN GOOD CONDITION AND A MUST HAVE FOR YOUR COLLECTION OR IF YOU HAVE ONE THESE CARS.